I'd be more than happy with just a reissue of Energon Omega supreme in year of the snake colors reissue with him already being a headmaster it fits the existing line pretty well. 1. Scorponok both a leader and titan sized version (Hasbro/Tak could even justify doing leader size versions of the other city bots, just like the G1 GR range. 3.Hoist/Trailbreaker, The last generations figure is a niiice toy but it looks nothing like the g1 character. 4.Tripple Changing Ultra Magnus (that can carry deluxe cars) or Equally a Tripple changing gun galvatron (Leader class). 5. More of the minibots/throttlebots etc. I would agree with most, if not all of the above, and would add a few. It was a crying shame we didn't get the Seacons in either the CW line or PotP. I would have liked to have seen all of them, with one of the limbs as a Legends class that would be (or be added to) the weapon for Piranacon. I think a lot of the engineering for the PotP Terrorcons could have been used here. War for Cyberton Part 1, perhaps? I think it would be neat to see an "evolution" Omega Supreme - a Leader-sized tank character ("Omega?") combining with the base parts (but not as "partsformer" as the original) to form a CW Devastator-sized Omega Supreme. We needed WAY more combiner-friendly Decepticons in the Prime Wars Trilogy toyline. Not having limbs for Galvatronus was lame, especially considering how many Autobots Hasbro did. The molds were there to use. How about Runamuck and Runabout from CW Dead-End? The Air Strike Patrol re-imagined as Deluxe-sized combiners based on the CW Aerialbots? PotP could have given us a lot more - maybe WFC I will have some??? Wolfman Jake wrote: Upscale that 2006 Classics Seeker mold, Hasbro! Give it some added articulation to match the voyager size class and EVERYONE will buy them. Every single one of them you repaint and retool! Trust me! I can't think of any figures I'd want here. Almost all the characters I had wanted new figures of that got ones in CW/TR/PotP were done in such a disappointing half-hearted way with forced gimmicks they never had in the first place. I just don't trust Hasbro to design them well anymore. Motto: "Why are yoo runnin'? WHY are yoo runnin'?" I do hope for new Shockwave, Ratchet and Omega Supreme toys, I'm not as fussed about Ironhide because the Combiner Wars Deluxe is good enough for me. More than anything, I just hope the War for Cybertron trilogy gets more creative with designs and moves away from the "Just remake the original toy with better articulation" approach that's been heavy in the Prime Wars Trilogy. Something not being accurate enough to G1 is a common complaint in this fandom, but in my eye, the Power of the Primes Dinobots and Terrorcons are TOO accurate to G1 and they don't look that great. I'd like to see more creative liberties with designs going forward, I don't mind if a figure isn't a complete 100% accurate recreation of the original, and I enjoy seeing updated alt modes. Shockwave absolutely deserves a Voyager toy. What I'd really like is a triple-changer Shockwave with robot (of course), "hovertank" and "artilery piece" modes- the artillery form being a fanmode away from his classic ray gun mode. Though honestly his CW Legends toy's alt mode of an orbital space cannon that could also be handheld was pretty sweet, so if he was a regular Voyager with no extra gimmick I'd dig that as the inspiration (not a straight upscale of course, that would be silly). The others I agree with too. Deathsaurus/Dezarus/Deaths'R'Us needs a new toy desperately. Omega Supreme likewise, though I would like it if they didn't go too slavish to the G1 design- his robot mode is cool but I'd rather he was a "regular" Titan with two altmodes (preferably a big spaceship thing and a base mode) and very little partsforming, if any, to go between them. Apeface and Snapdragon definitely need new toys. I don't particularly care about them myself but it would be nice if we got them. And for the love of god, Ratchet and Ironhide absolutely deserve new figures. The closest to a decent update we got was the old retools of Energon Tow-Line from FunPub. It's about time they got something. Some other figures I'd like to see get updated properly include Inferno and Grapple (that POTP retool of CW Hotspot ain't cutting it), Trailbreaker and Hoist, and Nightbeat (doubly so if it means we get an actually good Minerva out of it). Seacons would be nice too but I don't see them happening in WFC. Take Omega Supreme off the list and replace him with Scorponok. The titans should be actual city bots. Im good with Platinum Omega Supreme because unlike any future "titan class" figure, he actually scales properly in cartoon scale. Would I like him to look more G1 ? Sure I would. But Id be horrified to see how they screw up scale like they did with Devastator and Predaking. Oh hes a fan favorite so lets make him bigger than the other combiners...dumb f**ks at Hasbro. Smh. Ironhide/ratchet ? Really ? While the Henkei figures werent perfect, they are still awesome and fit the bill just fine. And while im not a fan of them, CW Ironhide and UW ratchet are just fine for those younger collectors who werent even born when the G1 cartoon was out. And if you want to go all out vintage toy look (with a chug touch) pick up Botcon 2005 ironhide and ratchet. 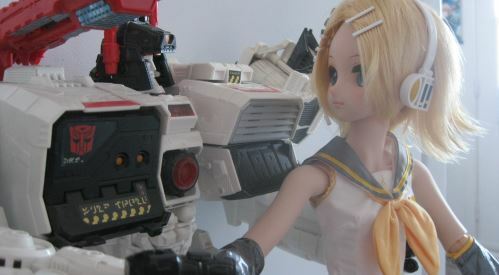 Those two are awesome figures, possibly even cooler than the Henkei. (And im not even going to get into Animated, RID, and Bayverse incarnations) So no we dont need a yet another set of these two overused characters. Let them take a well deserved break already. Deathsaurus....well he is a very obscure character (to most american collectors) and he already has an awesome Botcon 2005 figure, however I wouldnt be opposed to a new mold for him. Keep it voyager though. Im sick of leader class figures because they are not in scale. In what cartoon was any decepticon commander almost 3 times the height of his troops? With the exception of a very few characters such as Jetfire, ginrai, ultra magnus, and rodimus prime (scale is debatable on him) the whole "leader class" scale seems to be pointless. Rated X wrote: Take Omega Supreme off the list and replace him with Scorponok. The titans should be actual city bots. Im good with Platinum Omega Supreme because unlike any future "titan class" figure, he actually scales properly in cartoon scale. Would I like him to look more G1 ? Sure I would. But Id be horrified to see how they screw up scale like they did with Devastator and Predaking. Oh hes a fan favorite so lets make him bigger than the other combiners...dumb f**ks at Hasbro. Smh. The Energon OS was a good mold for its time but it's horrendously dated by today's standards, especially articulation wise. As for scale, whilst I agree that Devastator and Predaking were made way too large, that was an issue from actual quality standards rather than scale. Devastator can work being large (construction vehicles are HUEG) and Predaking was always enormous. As for Omega Supreme, his size was highly variable but mostly colossal- remember when he grabbed Astrotrain (in his already enormous shuttle mode) in his claw? Plus, you know, building a cartoon display based on scale is entirely pointless because the scale was about as consistent as a chameleon at a disco. I'd rather have "out of scale" toys that are fun with good play value and good display presence than mediocre figures who are reasonably scale-accurate to a particular frame from the wildly inconsistent cartoon. There's a reason the Henkei/Universe Ironhide and Ratchet are as reviled as they are. I mean if you like them that's fine but that is not the popular opinion, and most of us want something better. And the Botcon figures, whilst cool and all, are very dated and very hard to get for a non-walletrape price. Now lets jump to the positives. I totally agree with you on voyager shockwave. However I need that space gun. Or at least turn it upside down and call it a submarine lol. ...I will never understand why you refuse to make the jump to MP scale. It's all cartoon-accurately scaled (at least as close as is humanly possible) and they all have their proper alt modes. You aren't going to get what you want out of CHUG. Enjoy your hollow, cheaply-made brick I guess? Probably because they're obscure characters who did precisely nothing in the G1 cartoon. I mean I think they deserve figures too but I can see why they didn't bother. Deathsaurus....well he is a very obscure character (to most american collectors) and he already has an awesome Botcon 2005 figure, however I wouldnt be opposed to a new mold for him. That figure is really rare now. Keep it voyager though. Im sick of leader class figures because they are not in scale. Actually, Deszaras/Deathsaurus/Dezzer Russ was the same size as Star Sabre, who was only just shorter than Liokaiser. So yeah, Leader class would be ideal for him. In what cartoon was any decepticon commander almost 3 times the height of his troops? Ironically enough, the one he came from! And Masterforce for that matter, where Overlord and Black Zarak were pretty huge. With the exception of a very few characters such as Jetfire, ginrai, ultra magnus, and rodimus prime (scale is debatable on him) the whole "leader class" scale seems to be pointless. Yeah, not like they're toys that are meant to be big and fun, and fill a pricepoint. No siree, they most only make them to spite you. Agreed, Battletrap is from what I understand great so his counterpart would be nice. Sure, why not. The TR Decepticon Targetmasters were good toys, I just hope they get made Headmasters to fit in with their Decepticon counterparts. Definitely, I just hope if we get a Minerva they don't screw her up and make her a straight headswap of Nightbeat. That would be cool, I agree. We have got Cindersaur now so the other two are possible. Given that Cindersaur is a headswap of Slash I actually wouldn't mind Sparkstalker being retooled from Kickback and Flamefeather...well he'd need a new mold but you get the point. Honestly Chop Shop deserves an actual deluxe figure (as all the Deluxe Insecticons do). 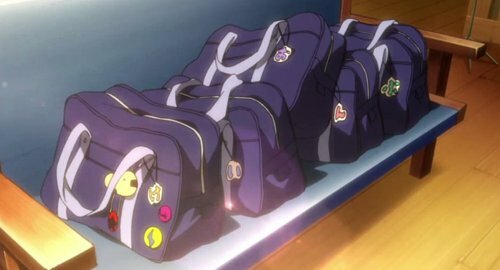 They weren't in the cartoon so our only reference for size is the old toys. Agreed, though how they'd handle the three member altmode I'm not sure. They'd have to release him as a three-man set or else somehow give each member their own separate altmode. Probably because even by the standards of the G2 combiners, Defensor was hideously ugly. Not even cool ugly like G2 Menasor- just plain repulsive. Whilst I agree an actually sensibly sized and thus not riddled with compromises Devs would be nice, it ain't happening unless we get yet another change of design team. I'm happy with my Maketoys Giant anyway. No Scorponok? probably he's the 2nd place after Omega Supreme. Well at least there's ApeFace and Snapdragon. Rated X wrote: Ironhide/ratchet ? Really ? While the Henkei figures werent perfect, they are still awesome and fit the bill just fine. And while im not a fan of them, CW Ironhide and UW ratchet are just fine for those younger collectors who werent even born when the G1 cartoon was out. And if you want to go all out vintage toy look (with a chug touch) pick up Botcon 2005 ironhide and ratchet. Those two are awesome figures, possibly even cooler than the Henkei. (And im not even going to get into Animated, RID, and Bayverse incarnations) So no we dont need a yet another set of these two overused characters. Let them take a well deserved break already. I'd still be inclined to disagree, here. The Classics/Henkei molds aren't the worst things ever, but there are definitely plenty of people who're dissatisfied with those molds, understandably so I think. CW Ironhide is alright, but one could understand G1-style collectors wanting a van instead of a pick-up truck; and while I would love to use UW Ratchet as my Generations Ratchet, since I'm one of those younger collectors I don't really have the money to shell out for a box-set-exclusive Japanese import toy unfortunately. Similar sort of situation for the Botcon guys, and while I love a lot of the other-continuity Ironhides and Ratchets, they're always aesthetically different enough that they don't really fill the same spot. I think what it comes down to is that Ironhide and Ratchet have gotten plenty of figures, but they always seem to end up getting shafted one way or another. Be it disagreeable design or price/exclusivity, it's still really hard for a lot of collectors to get representations of these classic characters that they're satisfied with. That's why they're still so highly-demanded, I think. 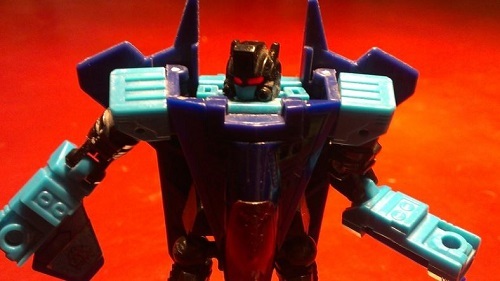 Rated X wrote: Deathsaurus....well he is a very obscure character (to most american collectors) and he already has an awesome Botcon 2005 figure, however I wouldnt be opposed to a new mold for him. Keep it voyager though. Im sick of leader class figures because they are not in scale. In what cartoon was any decepticon commander almost 3 times the height of his troops? The very cartoon that Deathsaurus came from. He was a gigantic combiner-sized Decepticon leader just like Overlord and BlackZarak were. Ever since Fort Max and Scorponok came along, Autobot and Decepticon leaders all got much bigger in size over in Japan after 1987. I also love the evolution gimmick from Power of the Primes and would love to see a Megatron that evolves into Galvatron or whatever they had planned of Hound or Arcee or any of the other characters had won the contest. They're one of the last "Classics" styled sets where there are literally 0 options available. I still don't understand the appeal of the BotCon 2005 versions of Ironhide and Ratchet beyond the novelty of the original toys' "weapons sled" components. Those head sculpts are FUGLY. The robot mode proportions are odd. The overall size of the figures is small, even compared to today's deluxe sized figures. Wolfman Jake wrote: I still don't understand the appeal of the BotCon 2005 versions of Ironhide and Ratchet beyond the novelty of the original toys' "weapons sled" components. Those head sculpts are FUGLY. The robot mode proportions are odd. The overall size of the figures is small, even compared to today's deluxe sized figures. I am really not a fan either. Well I'm all in favor of a Leader Class Deathsaurus but I doubt Hasbro will do it, given their track record. Still, if he does happen he'd be good custom fodder for a dragon Megatron and/or Onyx Prime. Thanks for the replies that it's not from the High Moon Studios game. And a shame to, but off topic. Ontopic: I really don't have that much of requests. Hasbro / Takara already exceeded my expectations by lightyears with the Prime Wars Trilogy and Generations before that. What I would really like is a normal G1 voyager sized Optimus Prime and Ironhide/Ratchet. I'm fine with everything else. If we don't care about the ranking, I have NOTHING to say against any entries of this list. Leader Scorponok? Come on, man. You can't make the BIGGEST G1 toy into a leader. Titan or bust. As for Reflector, I really wonder how a Cybertronian Reflector team could be re-interpreted as? 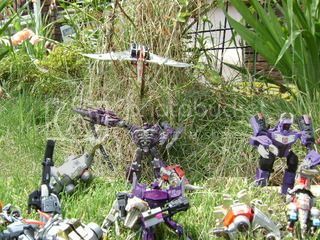 -Kanrabat- wrote: Leader Scorponok? Come on, man. You can't make the BIGGEST G1 toy into a leader. Titan or bust. A lot of people really like Comics Scorponok better than Cartoon Scorponok. I definitely want a new Ratchet. Awesome list! Do Classic Marvel Comics Scorponok can become a city? If not, I'm fine with it... Especially if he come with a vat and a Pretender embryo. Do Classic Marvel Comics Scorponok can become a city? Nope. Just a big scorpion. He and Fort Max have traditionally been non-giant, slightly-larger-than-average-sized dudes in the comics. Only the cartoons had them be gigantic like Metroplex and Trypticon. Well, I think that die has already been cast. We have a Titan Class Fortress Maximus already. His rival will NEED to be Titan sized too for parity in the Generations toy line. For anyone who really wants a smaller Scorponok, though, I would suggest the BotCon "Pirate" Scorponok figure. It's big, chunky, and although not exactly leader sized, since it's a mold from way back in Superlink/Energon, it'll still tower over most of the Deluxe and Voyager figures in your collection, especially those from recent years. The BotCon remold is even a Headmaster to boot! Let the rest of us have a proper, city-forming Titan Class Scorponok. 4,255 pages were recently viewed by 743 unique visitors. This page was viewed 1 times on Thursday, April 25th 2019 2:49pm CDT. © 2019 Seibertron, Inc. DBA Seibertron.com. All Rights Reserved. Established June 2000. Seibertron.com is owned by Ryan Yzquierdo.